The Beatles' album Sgt. Pepper's Lonely Heart's Club Band has always held a special spot for me. It was actually the first Beatles' album that I owned (cassette tape actually). I know that for you first generation fans reading this, it is hard to think that Pepper would be someone's first real exposure to the Beatles, but that is how it was. I listened to that tape nonstop for a very long time and it was the first Beatles CD I purchased once I could afford it. For many years Sgt. Pepper was my favorite Beatles' album and "A Day in the Life" was my favorite Beatles' song. However, I grew and matured as a Beatles fan and was exposed to their entire catalog and my favorite eventually switched to Rubber Soul. To be honest, Pepper has been sort of pushed to the back of my Beatles' collection and I really hadn't listened to it in quite a while. Since 2017 is the 50th anniversary of the Sgt. Pepper sessions and album, it is a great time to dust off the album and give it another listen. It was with this mindset that I went into seeing the film Deconstructing Sgt. Pepper at the Tivoli theater in St. Louis with my mom and some other great fans this past Monday night. I really didn't know what I was going to watch. I just knew that it was something Beatles. I quickly learned that I was going to see a lecture by Scott Freiman about the breakdown of the album. 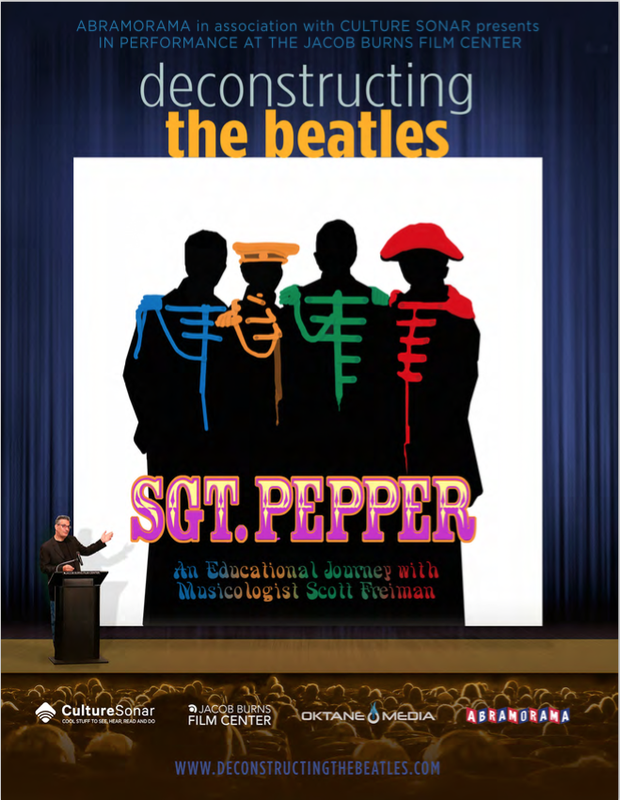 I was not familiar with Scott at all, but apparently he teaches Beatles courses at the university level as well as being a very successful composer and producer. If you are like me, your first thought when you hear the word "lecture" is "oh no---this could be really boring." However, I am happy to report that Freiman's lecture was far from boring . It was very entertaining and educational. As the title, "Deconstructing the Beatles" would suggest, Freiman went through the Sgt. Pepper album track by tack and talked about each song in detail. He gave the background information of why the song was written and then talked about the actual recording of the song. He showed photographs of what the various instrument that were used on the songs, which I found to be helpful because I can read the name of the instrument in a book, but without a photograph of it, the name alone doesn't mean a lot. Most of the time was spent breaking down the songs. 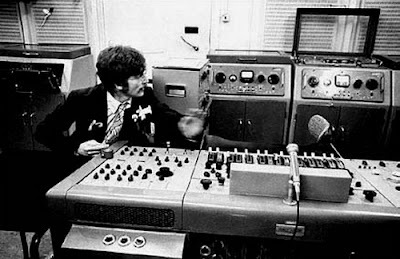 Parts of the songs were played by isolating the individual tracks so that you might only hear Ringo's drumming or John's vocal and then he showed all it all went together to make the song. There were plenty of photographs of the Beatles in the reading studio as well. My only real complaint is that some of the songs he just skimmed over and didn't break it down. Fixing a Hole, for example was just mentioned in that "yeah--that song is on there. It might have been about Paul fixing up his home in Scotland." I would have liked more information. If we are deconstructing the Sgt. Pepper album, then let's do it for all the tracks. There were some really neat things that came out during this lecture. Some of the things I already knew, but for someone who doesn't know the Melanie Coe story, I am sure would be interested in seeing the video clip that was shown. I didn't know that on the song "Lovely Rita" the Beatles used a comb wrapped in toilet paper to make the kazoo like sound. I also liked hearing what the Beatles were saying underneath the animals noises at the end of "Good Morning Good Morning." It was a very interesting lecture and I think it was a perfect way to celebrate the 50th anniversary of the Sgt. Pepper album. I am not sure if this program will be released on DVD or shown on a streaming site anytime soon. But if it happens to be showing in your area, it is well worth your time to go see it for yourself. 50 years ago today the Beatles started recording Fixing A Hole. Paul didn`t start fixing up the farm until he was seeing Linda. The song is about Paul enjoying life alone in Cavendish, and fixing up that house !! I've seen Deconstructing The Beatles' White Album in our local art theater. I didn't want it to end! Great presentation.